Thanks so much for tuning in and welcome back to Season 3 of the Live Streaming Sunday Sessions. 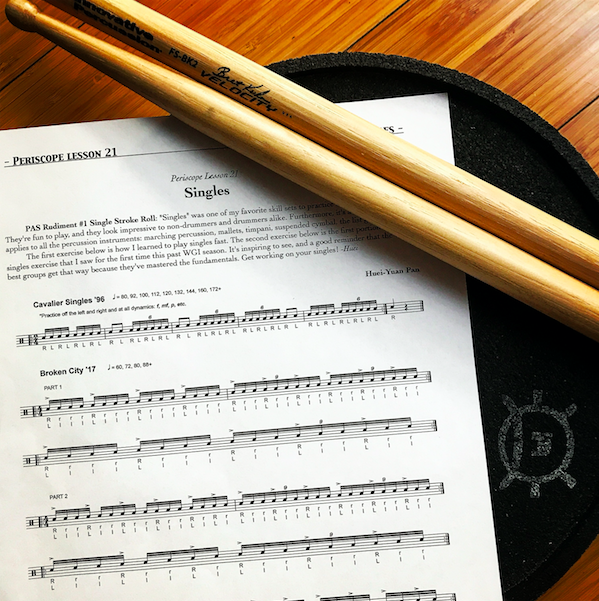 In this lesson, we cover 2 exercises, one from Cavaliers '96 and one from Broken City '17. This lesson shows you how to gradually build up your singles, making sure they're even and flowing. These are the foundational concepts you'll need in order to build speed and chops! Now is the perfect time to take all the inspiration you may be experiencing coming off of SCPA, WGI, and ADLA Championships, and put it into developing your own playing and teaching ability. Hope you have fun with this one, and when you make one up of your own, post it and tag me on your favorite social media platform @hueiyuanpan.